That’s William F. Brown, longtime editor of the American Field, writing in National Field Trial Champions 1956-1966. 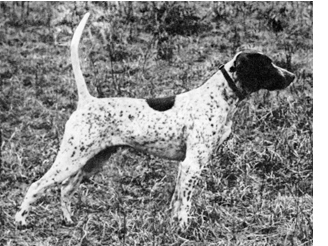 The dog whose virtues he’s extolling, Palamonium, a pointer owned by Jimmy Hinton and handled by Clyde Morton, was a two-time National Champion, winning in 1956 and again in 1959. The reason I quote this passage, though, is not to pay homage to the dog that inspired it. Rather, it’s because it strikes me as one of the best and most incisive summations I’ve ever read of the qualities that distinguish greatness in pointing dogs — the qualities that, from the beginning, All-Age field trial winners have been expected to display. To touch on an observation I made in Part I of this article, these are the dogs that set the bar, continually pushing the limits of bird dog performance and redefining what is possible. And these are the dogs, too, whose “blood” the rest of us have sought, historically, in an effort to instill these same sterling qualities in the pointers, setters, Brittanys, and German shorthairs we hunt birds with. That, at least, is the theory, the operating assumption that’s been in force for more than a hundred years. The overarching purpose of field trials, after all, is to provide an objective yardstick for comparison and thus promote the goal of breed improvement — allowing us to identify and breed “the best to the best,” as they say. Circling back to where we left off last time, the question of the moment is: Are field trials still serving this higher, nobler purpose? 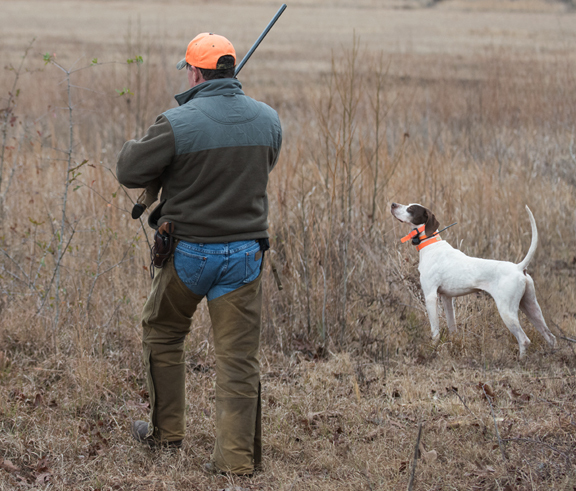 Are they recognizing, rewarding, and “selecting for” the qualities exemplified by a dog like Palamonium, qualities that we in the bird hunting rank-and-file desire in our own dogs? Certainly the classic All-Age events, which on the surface occupy the furthest remove from “real world” bird hunting, are the most scrutinized (and criticized) in this regard; but I think it’s fair to widen the parameters of the discussion to include the larger world of horseback field trials in general. 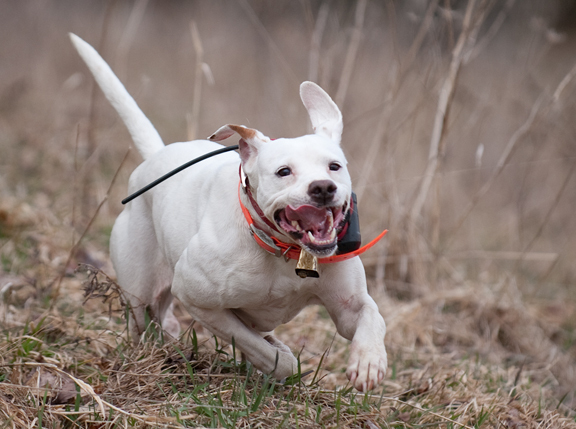 Is this field trial “type” dog still relevant to the needs of bird hunters? Do these dogs still matter? 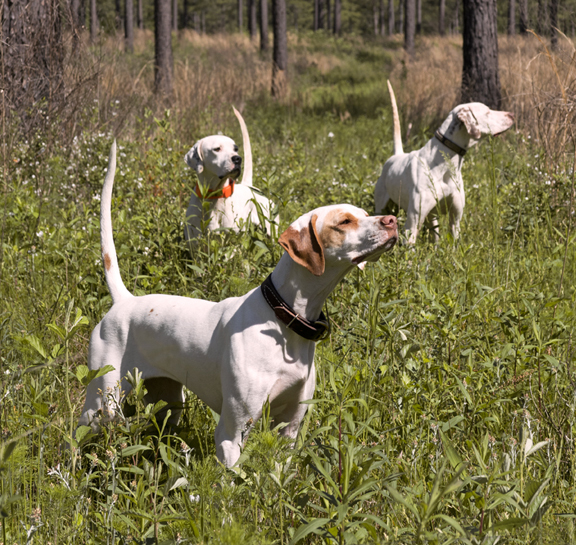 Maxine, Ought and Mike, All-Age bred* dogs pointing quail in southwest Georgia. “I’d argue that they matter more than ever,” says Rick Snipes, the Aspermont, Texas, sportsman who in addition to being “the consummate quail hunter,” as I’ve heard him described, serves as the President of the Board of Trustees of the Rolling Plains Quail Research Ranch. “And they matter in the same way that the race track matters to the automobile industry and the competition shooting sports matter to the hunter who carries a shotgun. Most advances in guns and shells came through the unforgiving trials of the pigeon ring. Few of us ever shoot for big money, but our guns are the product of those who did. Warming to the task, Snipes adds, “Another factor making field trials and field trial dogs more important than ever is the disappearance of the neighborhood bird hunter who bred his great dogs so that his friends could get a pup from them. Those guys have largely gone — along with some of the charm of bird hunting — and as their numbers have decreased, the number of good ‘country’ bird dogs has decreased in direct proportion. 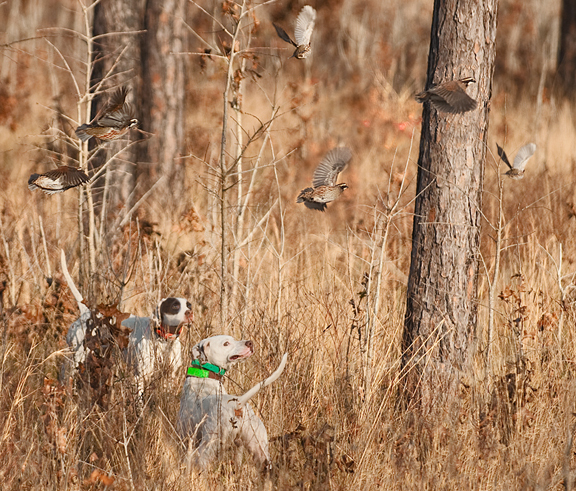 Preserves and dogs for that kind of hunting have probably increased, but pardon me laughing at the notion of a preserve dog trying to find and handle wild, native quail in, say, West Texas. I might as well try to cover Odell Beckham, Jr.! Divided find on wild quail at the 2014 Florida Open All-Age Championship, Chinquapin Farm, Branford, Florida. The Florida is one of the country’s most coveted All-Age field trial wins. Frank LaNasa, while using somewhat different language, largely echoes Snipes’ sentiments. A field trialer (both as an amateur handler and as an owner of professionally handled dogs), bird hunter, and pointer breeder, he hails from Isanti, Minnesota. When he prefaces the conversation by saying “There’s no place I’d rather be on a crisp October day than a northern Minnesota grouse cover,” it tells you that this a man who (a) has his priorities in order; and (b) has an uncommonly broad perspective on the topic at hand. LaNasa believes that All-Age dogs suffer from an image problem. 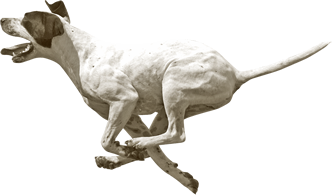 “The perception among a lot of hunters,” he muses, “is that they’re not ‘real’ bird dogs, but some kind of hybrid racing animal. Well, if all you’ve seen are untrained runoffs at small trials, of course that’s going to be your perception. But once you’ve witnessed what the best All-Age dogs are capable of, you find out the truth: that these trials, and these dogs, have everything to do with hunting. “I compare it to golf. If the only golfers you’ve seen are the duffers at the local ‘muni,’ your perception of the game is going to be a lot different than if you’ve had the opportunity to watch the top pros play. When Dustin Johnson hits a driver, it looks a lot different than when your cousin Vern hits a driver. Having competed actively in both the All-Age and Shooting Dog ranks, LaNasa acknowledges that there’s some overlap—but stresses that there’s a crucial difference as well. “All-Age trials are primarily a game of genetics,” he says. “Shooting Dog trials are about genetics, too, but they’re really more about a kind of highly refined service to the gun. 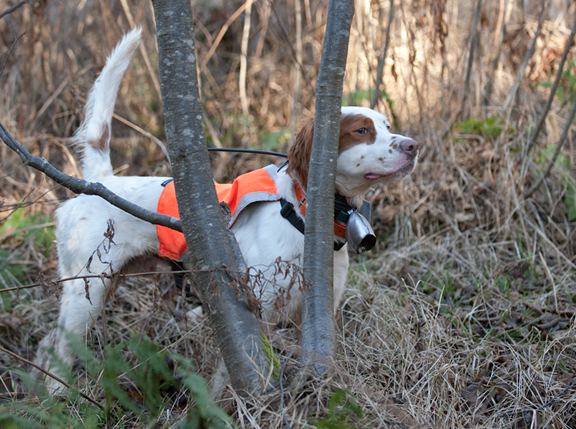 Grouse trial setter Quail Trap Will is a son of 2 x National Champion Shadow Oak Bo. That having been said, though, Wendling—a student of genetics and a disciple of Bob Wehle who breeds fine Elhew-strain pointers at his kennel in Bayfield, Wisconsin — believes that for many sportsmen, even those who admire and demand fast, classy, hard-driving dogs, a little All-Age “blood” goes a long way. In the course of a long, thoughtful e-mail that I can only scratch the surface of here, Wendling argues that the modern All-Age dog is a different animal than he was in the 1940s and ‘50s (Palamonium’s heyday), and that the adoption in the 1960s of the Tennessee Walking Horse, which allowed handlers to ride faster and stay in contact with wider-ranging dogs, was one of the primary catalysts in its creation. And what is “it,” exactly? A dog that runs much bigger, and exhibits more independence, than anything seen before. Wendling argues, further, that these qualities are now well-fixed within the genotype — the genetic blueprint, essentially — of the All-Age pointer and, to a somewhat lesser extent, the English setter. They breed “true to type,” in other words. Breeders of what he calls “companion gun dogs”— a category in which he includes Bob Wehle — have accomplished the same thing. In Wendling’s view, this means that the “drag of the race” theory, the tendency toward genetic mediocrity that can only be kept at bay by periodic infusions of higher-powered “blood,” no longer applies. The bottom line is that Wendling’s experience and observations lead him to believe that when you mix one genetic “pool” with another, what you’re likely to get is muddy water. He comes back to a statement Rick Smith made in this magazine a few years ago: “If you’re wanting a close-working dog for foot hunting, you’re not likely to be happy with a pup from an Open All-Age caliber field trial litter. The game you want to play. That’s a terrific point, but I’d add that it’s not just the game you want to play, but how you want to play it. If your preference is for a methodical, close-working dog, more power to you. Nothing in this sport is written in stone; no one should dictate the terms of your enjoyment. But if your preference is for the kind of dog Nash Buckingham would have called a “stem-winder,” a tail-cracking, mud-slinging, cover-crashing demon that’s as thrilling to watch when he’s not making game as when he is, I think that field trials, and field trial dogs, still have value and relevance. Sometimes there’s a price to paid with dogs like these, dogs with a lot of horsepower under the hood that want to see what’s on the other side of the hill. Not every one of them makes the cut…but when you get one that does, stand back. And enjoy the show. “I think there will always be hunters who are looking for those All-Age type qualities in their dogs,” he says. “For example, the kind of endurance that allows a dog to continue hunting hard, day-in and day-out — that’s something that comes from All-Age dogs. So does the ability to take the heat and handle rough country — characteristics that are a necessity if you’re hunting in places like Texas, Oklahoma, or the prairies. 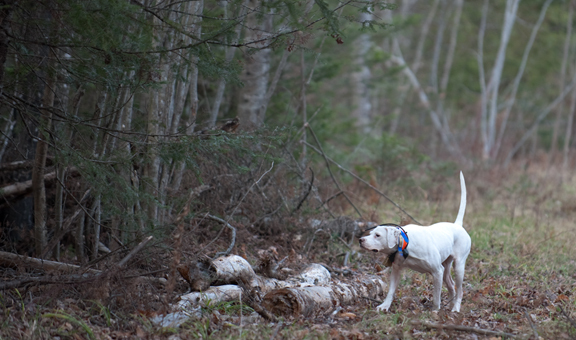 All-age bred* dog (whose pedigree boasts champions Paladin’s Royal Flush, Red Water Rex, Miller’s Silver Bullet among many others) shows her strength as both a grouse trial and grouse hunting dog. “Everyone associates All-Age dogs with extreme range,” Robertson continues, “but my concept of an All-Age dog is one that adapts his range to the country. That’s where qualities like intelligence and bird sense come in. I think you should be able to grab your shotgun, take an All-Age dog hunting, and shoot birds over him. [author’s note: Frank LaNasa fervently believes that, also.] In fact, I think taking an All-Age dog hunting from time-to-time makes him a better field trial dog. It helps build that bond that’s so important between a dog and his handler. 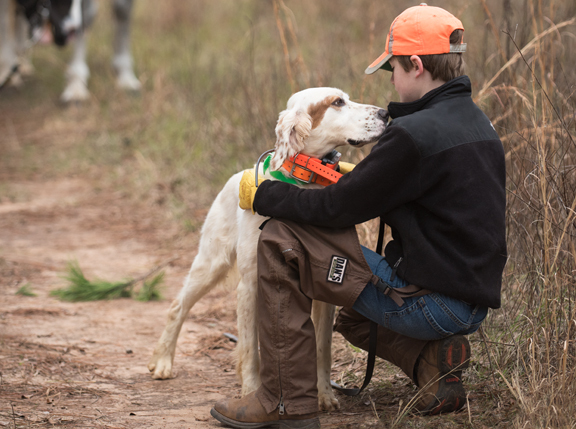 Retired all-age setter, Chickasaw Zachery is a favorite of this young field trial/quail hunting enthusiast. “Sure, an All-Age should ‘run,’ but he shouldn’t run off, and he shouldn’t make you look for him unless he’s on point. “I have a client in Arizona, a hard-core desert quail hunter, who’s been buying dogs from me for years. His goal every season is for every dog in his string to point 400 coveys of birds — and he insists that his dogs come from All-Age stock. As he told me once, ‘I need gritty dogs, and these dogs don’t know what quit is.’ That kind of heart and desire is something All-Age competitors have to have — and it’s something they can pass along to hunting dogs. 2012 Purina Top Dog Award Winner Champion Stallion, now retired from the All-Age circuit, is regularly hunted over by his owners on their quail plantation in southwest Georgia. Part II of this story by Tom Davis, Editor-at-Large at pointing Dog Journal was published in the July/August 2017 issue of PDJ. Back Issues containing Part I and Part II are available at PDJ. Thanks to Tom Davis for pursuing my suggestion of writing a story about All-Age dogs and to PDJ Managing Editor Jason Smith for recognizing the importance of the topic to pointing dog enthusiasts.